Nigeria's anti-corruption agency says it has shut down some 800 fraudster e-mailers and arrested those behind 18 high-profile "cyber crime syndicates".The Economic and Financial Crimes Commission said it has been working with the computer giant Microsoft to crack down on the scammers. EFCC head Farida Waziri said her agency was now using "smart technology" rather than raids on internet cafes. 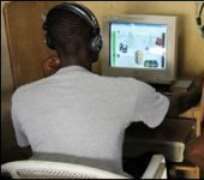 Correspondents say Nigeria is seen as a centre for web scams and spam e-mails. Cyber crime has remained a big challenge to Nigeria's security agencies despite efforts made in recent years to counter it. The con tricks - known as "419 scams" after the penal code that outlaws them in Nigeria - are often run by well-organised gangs. According to an EFCC statement, Ms Waziri said the new operation, called "eagle claw", would be fully operational within six months. "It will take Nigeria out of the top 10 list of countries with the highest incidence of fraudulent e-mails," she said.